Is Common Sense Really THIS Uncommon? Treehugger recently gave advice on using LESS paper towels! Yep, only use one square after shaking your hands off is their advice. Really? Are we so dumb that we can’t figure this out without a post from Treehugger??? How about NOT using ANY? In a public bathroom, don’t use one, shake your hands off. At home, NEVER use them, never buy them. Use an old fashioned dish towel to dry hands or dishes. Buy cotton terry dish clothes, they really soak up moisture. 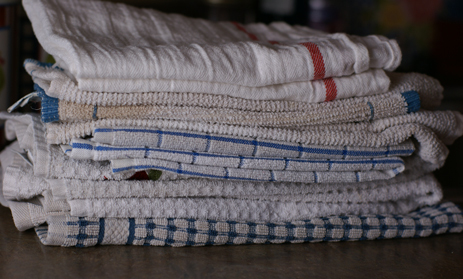 To wash dishes, use an old fashioned dish cloth. Don’t buy plastic Scrubbies. It is possible to mostly avoid plastic in the kitchen.